Howard from Forte Talent was hands-down the reason our wedding was a success! I used to cater weddings and I've seen firsthand how a DJ can make or break a wedding, which is why it was so important for me to find an experienced professional entertainment coordinator. Howard did not simply play music, he ran the entire wedding from start to finish. Every detail was mapped out ahead of time and he always made sure every decision was about "us." He said many times "remember, you're paying me," which shows how he strives to cater to your personal style. The last thing I wanted to do on my wedding day was keep track of a schedule. Howard seamlessly guided the party so we could relax and enjoy ourselves. 100% the best money we spent on the wedding. And ask about his rehearsal dinner services! Something totally new and different and our wedding party had so much fun! Thanks so much Colleen! Making sure you & Alex had a perfect, fun, and RELAXING day is what I was striving for. All the preparation that goes into making a day that special is something many people overlook when hiring their "D.J.". We are responsible for one of the most important days of your lives and the great ones know it! lol. My saying "Remember, You're paying ME" was kind of my way of noting that I was in YOUR service. Coming to your home for meetings, wasn't something out of the ordinary in MY eyes, YOU two were my client, you were retaining my services. It's simply the way I think it should be done. Personal Service for a very personal occasion! You were both a pleasure to work with and it was an honor to serve as your Reception Entertainment Director! HOWARD WAS AMAZING! Not only was he a phenomenal DJ that knew how to read the crowd and respond in turn, he was a great emcee, and he brought his own lighting system to spruce up our dance floor! Howard met with us several times to ensure that he was always up-to-date on any changes going on in our wedding. He even came to the rehearsal to help coordinate and let us practice to the right music. Before the ceremony, I relinquished all control to him (not easy for me), but he had the night run so smoothly. He kept everyone having fun on the dance floor and was very charming. He even joked around with the best man to help him relax a little before his speech. When my father started getting too emotion/nervous during our father/daughter dance, I simply gave Howard a knowing nod and he gently faded out the music. All of my friends and family told me that they've never had more fun at a wedding and I know it's mostly because of Howard. Howard was the BEST! I'm positive my wedding wouldn't have went as well as it did if it wasn't for him. To start out, he asked us about EVERYTHING. He was nice and funny and really wanted to make sure that he did a great job. He helped with the planning in so many ways. When I was looking for ways to entertain my guests, he had tons of ideas. When I waffled on what songs to play when, he was patient and understanding. He was very flexible and always returned my emails or calls. 1.) He listened to everything we said and ensured that what we wanted happened. 2.) The guests LOVED him! All throughout the wedding we were getting complements on him. Normally, you hear about things after the fact, but this was during! 3.) He brought out appetizers to us during pictures to check the status of the grand entrance. It was so thoughtful! 5.) Constant updates throughout the day. I always new what was coming next and how to prepare for it. All in all, I would recommended him to anyone and if anyone ever needs a DJ, I will only recommend Howard!!! Thanks Michelle! It was my honor to make your day special. I know it may have seemed like a lot of questions at first, but now you see why I wanted to get to know you both! Any "D.J." that doesn't ask about everything, is doing you a disservice and I believe is more concerned with a check than your once in a lifetime day!!! I'm very happy that I helped make your day a special one for you and your guests! Jayson & Donna. Thank you so much for allowing me to be a part of your day! It was wonderful to see another couple so in love. If you hire a D.J. for your Wedding Ceremony and reception, and they are providing music and microphones for the Wedding Ceremony, I don't understand how they CAN'T show up for the Wedding rehersal. Everyone in the Wedding party needs to know your music, your timing, where you're supposed to stand, when to come down the aisle, how long it takes for the Processional etc. (nothing worse than the song ending half-way down the aisle!! lol) Perhaps it comes from my time planning Corporate event shows and acting as Technical director for large productions. You need EVERYONE on the same page. You only get one chance to do it. Let's Do it right! I cannot express how Howard and Roberta from Forte Talent saved our wedding!!! First let me start by saying how awesome our wedding was!!! We hired Forte Talent as our vendor for our Ceremony Music as well as our Reception Music. Forte Talent is the most organized, fun, professional, caring, and creative vendor!!! At our dinner rehearsal, we had a little mishap with our Reverend starting our rehearsal without us!! Yes, without the bride and groom. HOWARD TO THE RESCUE!!! LOL. The only reason...ONLY REASON... that our rehearsal and our wedding day went sooooo smooth was because of Howard and Roberta from Forte Talent. Howard had everything down to who was walking down the aisle together, the program of the ceremony, the order of events at the reception (which he helped us plan perfectly!! ), who was related to who, how to pronounce everyone's names, etc. I really can't tell you how much he did for us. What is great about Forte Talent was that Howard communicated with all of our other vendors. I have found that this was key. With our permission, he contacted our other vendors so they were all in sync with each other and everyone was on the same page. He did this so that our photographer could get the best shots, the videographer could get the best footage, and so that we had no worries at all. What other vendor does that??? Howard listened to what we wanted, helped us tweak and make choices, without being pushy :) He has so much experience and it completely shows in his work. He truly enjoys what he does which makes all the difference. He is so much fun!!! He knows how to get a crowd going and to keep the flow. Literally, because of Howard and Forte Talent, the only thing that went wrong at our wedding was that we had the wrong salad dressing...lol.. What bride doesn't want that perfect of a day!! Forte Talent is the BEST DJ vendor out there hands down. When he told us our price quote for everything, we thought he was kidding. Knowing what I know now, I would have paid ten times what we paid just to have Forte Talent as our DJ Vendor. He even helped us get a Gobo Light for our dance floor since we had no idea where to find one. Thanks again for that Howard...lol. 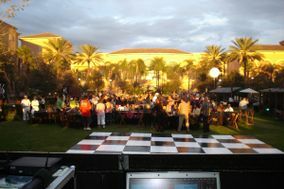 We got so many compliments about all of our vendors, but everyone could not stop talking about how awesome our DJ was. Now that I have been a bride, I can truly say that a DJ can make or break your wedding. Thank you again Forte Talent!!! Howard, you are awesome. We are blessed to have met you and your wife and to have worked with you. You and your wife are truly amazing people. Thank you again!!!!!! Howard did an amazing job accommodating to our requests all the way to the wedding day while always maintaining a very high level of professionalism and an attention to details. He guided us through the steps of a wedding we were not always aware of which was a great help. Things were done as discussed and even more. I am really glad Howard was there on our wedding day! I highly recommend Howard to anybody looking for an experienced DJ, who will go above and beyond to work with you and bring a very high standard of work.